Articles and other relevant information/records are listed below, in chronological order. Blue dates are links to the original article/record, or to a PDF copy archived at aiREFORM.com. If there is no link or the link is no longer active, copies may be available from the deeper (offline) archives collection, by contacting aiREFORM.com. Readers are encouraged to submit links, PDFs and other records for inclusion in this reference archive. (307p) copy from FAA, but not a signed copy; created by contractor SEH. (4p) signed by FAA’s Nancy Nistler. (2p) article by Tom Steward, FreedomFoundationMN. (1p) article by Kirsten Faurie, PressPubs.com. (2p) article by Kirsten Faurie, PressPubs.com. (2p) Tom Steward, article at Watchdog.org. 3/15/2016 Greg Yankowiak email to FAA’s Josh Fitzpatrick, with 2 pictures, expressing need to update the EA. (3p) created by contractor SEH Engineering. (74p) created by contractor SEH Engineering. (2p) signed by Collette Adkins, Center for Biological Diversity. (4p) Minnesota Center for Environmental Advocacy, signed by Kathryn Hoffman & Brandon Pakkebier. (3p) collected 430 signatures thus far. 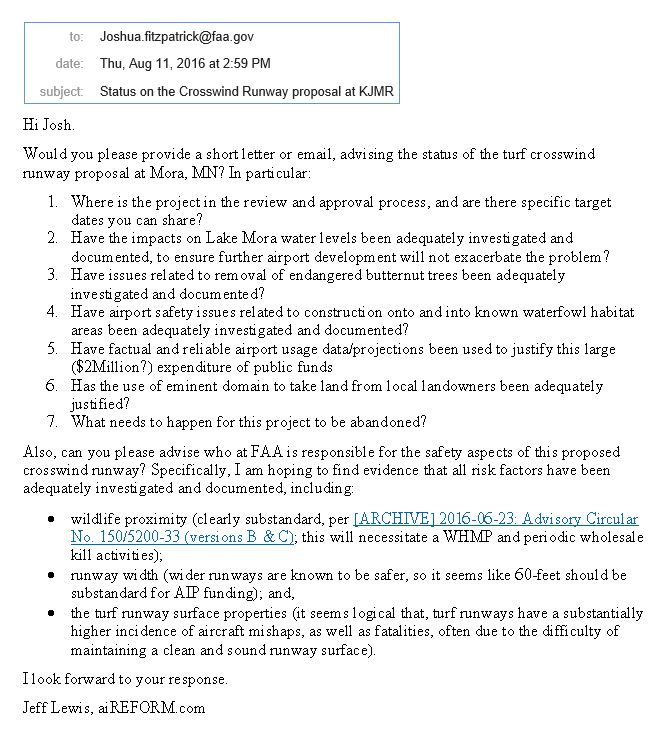 An aiREFORM email to Josh Fitzpatrick, the assigned Environmental Protection Specialist at FAA’s Regional Airport District Office.